This pin features a Pluto cupcake. The cupcake has a green wrapper with Pluto's collar around it. The icing is gold with Pluto's ears on it. This is Pluto from the WDW Character Pop Art Style mini-pin boxed set (#70033). Pluto is wearing his classic green collar. His paws are stretched out in front of his body. This listing is for the Pluto pin from the open edition "Nerds Rock!" Head Collection (#90174). This listing is for the Mickey Mouse and Pluto pin from the open edition "Disney's Best Friends" Mystery Collection (#90182). This listing is for the Pongo and Perdita pin from the open edition Good Vs Evil mystery collection (#90941). This pin features Pongo and Perdita, from 101 Dalmatians, in a circle frame that is white with black spots. This is the Pluto Admission Ticket pin from the PWP Admission Ticket Collection pin series. This listing is for the 101 Dalmatians pin from the open edition Mickey Mouse Icon mystery collection (#86540). This open edition mystery collection features various Disney Character on the Mickey Mouse icon. This pin is white with black spots and features a dalmatian puppy's red collar and dogtag. This listing is for the Pluto pin from the open edition Mickey Mouse Icon mystery collection (#86540). This open edition mystery collection features various Disney Character on the Mickey Mouse icon. 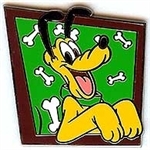 This pin is yellow and features Pluto's green collar and bone shaped dogtag. This listing is for the Pluto pin from the open edition Disney Characters as Cars Set (#94915). This pin features a Pluto customized car. The car has Pluto's ear and is black and yellow. The car is smiling with his mouth open and tongue out. One pin from the 10th Anniversary of Pin Trading mystery pin promotion at select Walt Disney World® Resort and Disneyland® Resort locations. This is one pin from a 20 pin series. Ten pins will be released at each park. For $1.00, with a minimum pretax $30 purchase, guests can buy one 10th Pin Trading Anniversary pin. The pins are in a small sealed black plastic bag. Which pin the guest receives is unknown until after purchase. Each of the 20 pins features a character as well as a pin trading logo with the word 1o written in various languages. The pins also contain clues as to what language ten is written in. This pin measures approx 1" across and .75" tall. This listing is for the all silver CHASER version of pin #91242. Walt Disney World 2012 Hidden Mickey Lanyard Series - Characters Sleeping collection pin features Pluto sleeping on some pillows. A silver hidden mickey icon is located on the lower left side of the pillow. This pin is part of the 2012 Walt Disney World Resort Hidden Mickey Series. This listing is for the all silver CHASER version of pin #82381. Walt Disney World 2011 Hidden Mickey Lanyard Series - Retro Classic "D" Collection features Pluto. Pluto is inside the letter "D" with the number "40". He is wearing his collar, and is walking with his mouth open and tongue hanging out. Small Hidden Mickey head icon located at the left of the pin. One pin from the Mickey and Friends Puzzle mystery pin promotion at select Walt Disney World® Resort locations. This is one pin from a five pin puzzle series. For $1.00, with a minimum pretax $30 purchase, guests can buy a Mickey and Friends Puzzle Pin. The pins are in a small sealed black plastic bag. Which pin the guest receives is unknown until after purchase. This pin measures approx 1.25" across and 7/8" tall. This pin is one of the WDW 2002 Flex pins given to guests who book a Flex Vacation Package at a WDW Resort. This pin has Mickey & Pluto and the 100 Years of Magic Logo in red with a blue background. This listing is for the all silver CHASER version of pin #91290. Disneyland 2012 Hidden Mickey Lanyard Series - Disney California Adventure Construction Fence collection pin features Mickey Mouse. This listing is for the Dug pin ONLY from set #79392. This pin was one of the Disney Store set. I do not think this one and the other 3 were limited - only the Mickey one. It shows Pluto and it says Tomorrowland 35 years. Pin is about 1" high. There is a framed map of the park that they go with. Disney Institute Pluto Pin class completion pin. Awarded at WDW and DLR. This listing is for the Pluto Pin ONLY from the 2013 Mini-Pin set (#93918). This pin features Pluto behind a green circle with a 13 in the middle. The word Twenty is above the number thirteen. This listing is for the Dodger pin from the Magical Mystery Pins Series 5 Collection (#95726). This Cast Lanyard pin features Mickey and Pluto enjoying a Paddle Boat ride. It is part of a five-pin collection highlighting various recreational opportunities at the Walt Disney World® Resort. This pin has a back stamp that says “3 of 5”. This pin is part of the Cast Lanyard Collection/Series 4 at the Walt Disney World® Resort. This is one of the pins that were released at WDW Downtown Disney's Christmastime in the City Event for Goofy's Tree-Trimming Tour. This pin is of Scamp, Lady and Tramp's puppy. He is sitting, facing the right and is peeking over his shoulders. Pluto (head only) is wearing an astronaut helmet and next to "2014" written in yellow with a small Mickey "ears" hat on top of it. Part of Pin 99739: 2014 DLR / WDW 7 pin Booster Set released at Disneyland Resort and Disney World. Baby Puppy Pluto is featured in this Open Edition pin. He is sitting, turned towards the left with his face looking straight ahead. He is smiling. He is wearing a light green collar. This listing is for the Pluto pin from the open edition 2012 mystery collection (#88122). This pin features Pluto in a yellow and blue star. Pluto is presenting the number "2012" among shooting stars. The numbers are in red, blue, green, and yellow colors. The "2" is red with buttons resembling Mickey's shorts. On top of the "2" is a Mickey Mouse ear hat. This pin belongs to the Sugar Skulls Mini-Pin set. # 102030 The skull for Pluto is black and yellow with a green stripe. His crossbones are white, like dog bones. Pluto is looking up trying to catch a glimpse of what is on his head. Don't worry Pluto, it is only Chip having a nap using an acorn for a pillow. On Pluto's right ear, Dale is stretched out having a nap. This pin features a print screen element. Pluto, with his tongue out, is about to pounce on a worried looking Mickey! The background is a light green color. Pins in this series can be arranged dozens of different ways to create short stories! Walt Disney World 2011 Hidden Mickey Lanyard Series - Retro Classic "D" Collection features Pluto. Pluto is inside a dark blue letter "D" with the number "40". He is wearing his green collar, and is walking with his mouth open and tongue hanging out. Small Hidden Mickey head icon located at the left of the pin. This pin is part of the 2011 Walt Disney World Resort Hidden Mickey Series. Did Pluto find something good? This Limited Edition pin featuring Pluto is part of the Visit Sunny Florida 2005 Pin Collection. Pluto is digging in the sand on the beach. There is a pink starfish next to him and a sea shell. There is a sand castle (or what's left of it!) behind him. This pin was designed by Disney Design Group Artist Michelle Morrow. A donut shaped pin representing Pluto with orange icing decorated with a bone and green collar. Part of a 15 pin set. This listing is for Pluto pin ONLY from the Disney Tsum Tsum Pin Collection #108000. This listing is for the Pluto pin ONLY from the open edition Magic Kingdom Festival of Fantasy - Starter Set (#107567). Pongo (right) and Perdita (left) from 1001 Dalmatians are show in front of a red circle background on this pin; it is one of 10 pins released in a boxed set (#1060) to celebrate the 10th anniversary of The Disney Channel. The pin measures 1 1/8" (28 mm) round. The backstamp is, "THE DISNEY CHANNEL, 1983-1993, © DISNEY, MADE IN CHINA." This pin is part of the Disney Channel 10th Anniversary Pin Set. This pin shows the Lady and the Tramp sharing a plate of spaghetti. Part of set # 108283. Chubby face, rosy cheeks, Pluto is wearing a green collar. Part of a 4 pin set # 108712 featuring Goofy , Donald , Mickey and Pluto as the Dapper Dans . This pin features Pluto whistling. This is a single pin from the Mickey Mouse My First Pin Trading Starter Set. Mickey Mouse and Pluto with a large blue star background and three smaller yellow stars. Hidden Mickey 2015 Wave B from Disneyland Resort. Pluto is pictured wearing a green and blue jester's hat with purple balls and a matching collar. This listing is for Pluto only from the 2016 dated booster set. This set features character faces next to 2016 written out with an orange 2, red 0 with a music note, green 1, and blue 6. 2015 Wave B Hidden Mickey for the Walt Disney World Resort. This is the Spacesuit Pluto, wearing a blue space suit with a silver hidden Mickey on the left shoulder.. Hidden Mickey Pins in this series are 112154, 112155, 112156, 112157, 112158. Chaser is 112146. This listing is for the Patch Tsum Tsum pin ONLY from the Disney Disney Tsum Tsum Mystery Pin Pack - Series 2 #116159. Each pack contains five randomly selected pins. There are sixteen pins in this collection. Pins in Pack #2: 116160-116175. For search purposes: 101 Dalmatians. Single pin of Pluto's head from (PP# 9265). Shows just Pluto's head with his tongue hanging out, and one ear up in the air. This listing is for the Pluto at Epcot pin ONLY from the Walt Disney World 2013 Starter Set #94792. This pin features Pluto at Epcot. Behind Pluto is Spaceship Earth. At the bottom of the pin is the year 2013. Pluto only from the 2017 starter set. Silver Pluto silhouette surrounded by silver stars on a green oval background. Colorful 2017 at the bottom. Pluto only -- Part of Holiday Booster Set # 72697: Accessory - Booster Collection - Holidays #2 Pluto with Uncle Sams Hat on top, salutes with white stars around him. 1 of 4 pins from a Disney Parks Pin Trading Starter Set. Pluto is carrying a tool box in his mouth. He is wearing safety goggles and a hard hat. Date on pin back is 2016. Number on pin back is FAC-039173-16010. The lanyard is a yellow measuring tape. This pin features Minnie Mouse in a pink dress and yellow shoes in a typical Minnie pose. It looks like she is about to curtsey. One of a collection of 16 pins in a mystery bag of 5 featuring various characters as ice cream bars or popsicles. This pin features Lucky from 101 Dalmatians. It's a white ice cream bar with black Dalmatian spots, the spots on the upper half form Lucky's trademark horseshoe pattern. Across the middle is a red collar with a yellow circular tag hanging from it. There's a bite taken out of the top right corner of the bar with a white drop of melted ice cream dripping down the right side. A tan popsicle stick protrudes from the middle bottom. One of a collection of 16 pins in a mystery bag of 5 featuring various characters as ice cream bars or popsicles. Pluto is yellow with a lime green collar around the middle. His gold dog tag hangs from the collar and has a small mark at the top of the tag. A bite has been taken out of the ice cream bar at the top right. It is white with a small white melting of ice cream down the side. The stick is tan. The Magical Mystery Pin Series 11– Pluto only. Circular pin with Pluto in green and Pluto's house in the background on the left side. This pin is part of Mickey’s 90th birthday party Booster set. Pluto is standing on his hind legs and is blowing a two toned purple party horn. There is a large yellow party hat behind him. The party hat has a red collar and dog tag and a red pompom on top. From the movie Bolt, we have this 2 pin set featuring Bolt and Penny who is kneeling to talk to him. Penny is wearing a red sweater and a black skirt. Lady and Tramp are in love and featured on this heart shaped pin with stars, some white clouds and a crescent moon in the dark blue sky. Pluto Tsum Tsum from the Tsum Tsum Christmas Mystery Collection. He is holding a candy cane in his mouth. Each box in this 8 pin mystery collection contains two randomly selected pins. Mickey's Not So Scary Halloween Party 2016 exclusive Limited Release Mystery box Spider web collection. This pin shows Pluto with his mouth open in a spiderweb. 2016 is printed above him on the right. Pins from this collection glow in the dark. Chaser pins are limited edition 999. Each box contains two randomly selected pins. There are twelve pins in the set: 9 Limited release pins and 3 Limited edition chasers. The Disney Parks 2017 Mystery Collection features characters in a purple circle with constellations above a silver 2017. This pin is part of the Disney Store's 12 Months of Magic Pin Collection. It is oval backing with Pluto and Mickey's two nephews sitting around a birthday cake. Pluto limited release pin for the Grand Opening of the Shanghai Disneyland Resort. Pin features Pluto on a light green glitter Mickey head icon. There are "emerald" and "diamond" jewels on the right side of the pin. To his right is a yellow silhouette of Shanghai's Enchanted Storybook Castle. Across the middle of the pin are the words: Grand Opening (the O has Mickey ears) in yellow. At the bottom of the pin are the words: Shanghai Disney Resort with Chinese below them, all in white. Disney Streets/Disney Parks - Street Signs Mystery Box - Pluto Ave.
Pin from a Pluto's Pursuit at the Disney University in Walt Disney World. Pluto the dog, faces right and is walking; he is in the middle of a round white pin with a blue and red crest in the middle. In the blue circular area of that crest are the words "PLUTO'S PURSUIT" in white. Around the top of the pin, in red, is "WALT DISNEY WORLD;" at the bottom, in red, are the words, "DISNEY UNIVESITY." The pin has a diameter of 1 1/4" (3.2 cm). 113665 Disney Streets/Disney Parks - Street Signs Mystery Box - Pluto Ave.
Pluto is peering over the top of a street sign stating Pluto Ave. This pin is one of eight in the Street Signs Mystery Box set. This pin is part of a 5 pin series of Rescue pins released during the Pin Trading Cruise on the Disney Cruise Line (DCL) Ship. It features Big Pete as a pirate behind Pluto on the beach. Pluto has a boot in his mouth and a treasure chest next to him. Designed by DDG Artist Cody Reynolds. This open stock rack pin releases at DLR features Pluto strutting his stuff in his formal wear, an 'emerald' collar and top hat with glitter all around him. Pluto is shown in front of the tree of life with his collar and name tag clenched in his teeth and a backpack on his back. The bottom part of the pin has Disney’s Animal Kingdom. This pin is from pin series 1 and is #7 of 10 pins. Pirate Pluto guarding a bone on a pile of treasure. This pin is from the runDisney 2018 Marathon Weekend Presented by Cigna (January 3 - 7, 2018) -5K. It is pin on pin with Pluto running, as the top pin. He is wearing a number 4 around his neck. The bottom layer pin reads Walt Disney World 5K with Run Disney on the center right. The bottom has 2018 next to Pluto’s front paws. It has a Mickey waffle back with 2 pin posts. Top box FAC 046730-17290. The center of the pin has two boxes, the left one is the OPT logo and the right box has presented by Cigna and their logo. Two boxes on the bottom with the upper box reading Limited Release and the lower box © Disney made in China. This pin released at ESPN's Wide World of Sports Complex during the Runner's Expo. Pluto is laying down in his dog house with his legs crossed in front of him. The dog house, on the right of the pin, is a light yellow with a red roof and a red & white "Pluto" sign over the door. On the left of the pin is a red dog bowl with a bone sticking out of it. This Limited Edition pin-on-pin with dangle features Santa Mickey Mouse and Pluto in front of the Sorcerer Hat and also has an ornament dangle which reads "Merry Christmas 2004". The bottom of the pin reads "Disney-MGM Studios". There are snowflakes on the white background. This pin will be released at Disney-MGM Studios. This listing is for the Honey, I Shrunk The Audience pin ONLY from the limited release reveal/conceal Epcot 30th mystery collection (#94523). This pin features Pluto as Quark the dog popping out of the show's 3D screen. At the top right of the pin is the Imagination Institute's light bulb logo. This pin is part of the Lands Are Haunted 2015 boxed set with a limited edition of 1000. Each of the 5 main lands of Disneyland Park and Magic Kingdom Park are represented with a Fab 5 character and a Halloween theme. The other 3000 were sold separately. Boxed set #111882. This pin represents Adventureland and features Pluto dressed as a pirate. One of six pins released at WDW for the 2001 Christmas season. On this pin, Pluto is ready to help with the decorations as he is holding some mistletoe with a red bow in his mouth. He is wearing his green Christmas collar with jingle bells. The front of the pin reads "Pluto Hanging the Mistletoe Christmas 2001." This is also a flocked/fuzzy pin. Pluto is startled after he sees a Disney Topiary of himself. Pluto is a pin-on-pin. This pin will be released at Epcot® - Pin Central. This is part of a 2 pin set #15808 featuring Minnie and Fifi. Fifi is here standing and waiting for a command from Minnie. Individual pins of this set include: #22501, #22502. This limited edition pin is part of the Winter Wishes Snow Globe Tiered Box Set (#125929) which features different characters having some wintry fun in a snow globe style pin. This pin features Pluto the dog bounding out of a snow pile, with one ear up and tail wagging, with snow stuck around his mouth like a Santa beard. The snow inside the globe is white glitter fill. The pin itself resembles a snow globe with a clear acrylic dome on top of the character and several silver diamonds or gems loose inside the dome which fly around like falling snow. The snow globe's base is white with a swirl sparkle fill and has the text "Winter Wishes 2017". This limited edition pin is part of a Twelve Days of Christmas series released at Disneyland Resort. Each pin depicts a scene from the song. The pins are limited to two per design per person. This pin features Pluto wearing a drum on his back with the number 12 on it marching in front of a Christmas Tree. The white ribbon on the pin reads Twelve Drummers Drumming. Pins in this series include: #17781 through #17792. This is the Pluto pin only from set #75949. The Disney Characters are featured in a graffiti style in this mystery pin collection. This Pluto shaped cupcake has a green paper sleeve cup base with a yellow cake and white frosting with colored candy sprinkles. On top is a pink strawberry gumdrop. There are two black dog ears, one lying down and the other upright and tilted as if listening. This pin Features Rolly the black and white dog from the movie 101 Dalmatians. He has just eaten and is laying in his red bowl. Puppy appears to be taking a nap after stuffing himself. Pin sizes is 1" x 1"
This pin features Pongo and Perdita from the movie 101 Dalmatian in a Dalmatian patterned heart frame. Perdita is leaning into Pongo's neck and looking up t him while he looks down at her They are standing in front of a telephone booth and street light. The pin measures approximately sizes is 1 1/8" tall x 1 1/4" wide. It has a smooth silver back with the Disney copyright and Made in China stamps. Lady and Tramp during their iconic spaghetti dinner scene. Pluto is 3-D standing in front of a Black & White photograph of Walt Disney. Walt most likely is walking on the tracks of the Rainbow Caverns Mine Train located in Frontierland. The background looks like the portion of this ride known as the Living Desert. Here they are: the Lady and the Tramp enjoying that famous spaghetti dinner. Pin was released as #73 in the Millennium series. 1955, written in the lower right, represents the year the movie was released. One of four Sounds of the Season pins featuring the Pirates of the Caribbean ride. Pluto (pin on pin), as the dog, is in front of the jail howling while red musical notes float from his mouth. The jail is decorated with Christmas lights and 3 stockings (instead of prisoners) with Sounds of the Season written beneath in red with holly around it. This pin features Ariel and Pluto, from the art work "Magic Carpet Ride" It's part of a 20 pin set that was released during the Afternoon of Enchantment Event in Orlando. The pins shows Ariel with her long red hair. below her you can see the head of pluto who is wearing a red collar and his tongue is hanging out. The pins came in Blind Bags. This pin features Snow White and a Dalmatian Pup, from the art work "Magic Carpet Ride" It's part of a 20 pin set that was released during the Afternoon of Enchantment Event in Orlando. The pins shows Snow White with one arm raised in a wave. The male puppy has his paw as if over a door/wall and his right ear is black. The pins came in Blind Bags. Pin #23 in the Disney Store Magical Musical Moments series, this spinner pin features The Fox and The Hound playing -- Tod (the fox) and Copper (the hound). The words "Best of Friends" appear around the top of the pin with the characters on the spinner. This pin is one of 12 stain glass pins at WDW, just like the stain glass set DLR had in the year 2009 this set will feature attractions/shows/lands and Disney characters particular to the WDWR. The pin measures 2 inch by 2 inch, is back stamped with the official pin trading logo 2010 and opens like a book to reveal an image. This pin features Pluto on Expedition Everest, he is on a cart with his head tilted to the side with a very big smile. This Limited Release pin is being sold only to Annual Passholders. The egg-shaped pin features Pluto and is called "Egg-Ceptional Passholder". The egg is orange with Pluto's black ears on the sides. His mouth and freckeled-nose are black. His eges are outlined in black with black pupils. A jagged edge runs across the middle under his mouth. A green belt runs across his middle under that edge. A black tag saying PLUTO hangs from the green belt. The last "L" appears to have Mickey ears on it. The is a portrait of Pluto in this pin, Pin is bordered with a frame. Pin comes on a Card: 3.5 x 5". Pin: 2.25" Part of the October release fully licensed LIMITED RELEASE full-size pins with ArtCard from ACME/HotArt. Pluto meets a new friend. Pluto is bent down on his front paws with his rear in the air as he looks at a duckling. Artwork designed by Schim Schimmel. Card: 3.5 x 5". Pin: 2" Part of a new line of fully licensed LIMITED RELEASE full-size pins with ArtCard from ACME/HotArt. This limited edition series of Christmas Wreath pins commemorates Disneyland's 60th Anniversary Diamond Celebration. This pin features Pluto wearing antlers and a jewel on the silver ribbon. This limited edition pin is the twelfth (12th) in a monthly series in 2016 featuring Disney Duets. This series features villains and heroes from different Disney movies framed in ovals. The villains are in color and in front of them, the hero is shown in profile in sculptured pewter. This pin features Cruella De Vil and Pongo. This is a shared release between Walt Disney World and Disneyland Resort. This is a pin of the month collection for 2018. It features donuts decorated as some of the more popular Disney Characters. Each month a new pin will be released. The eleventh pin is designed like Pluto, the golden colored Pup. The pin has his black ears and tail, wearing his green collar. Dug the dog, from the movie Up, is featured on this Character Key Variant (Pin). He has a ruby crystal on his collar. This pin features the Dalmatain Puppies Sleeping, from the movie 101 Dalmatians. 2 Pups from 101 Dalmatians, the bottom male puppy is sleeping on the right, his right ear is black and he is wearing his red collar. The female puppy with her blue collar is sleeping on her back with her front paws crossed and her hind legs drawn up. They have not been identified although the girl could be Fidget. the pin size is 2 3/8" Wide X 1 1/4" Tall These pins where Released at the Evenings of Enchantment August 2018 Trade Event in WDW. This pin series is created in a Limited Edition 500 Size but there are 5 versions, so of each version there are only 100. This pin is the second pin in the Pin of the Month 2019 series for Vintage Vinyl. This pin has Pongo, Perdita, and two of their pups on the front cover of a record album. The pin has a slider feature with a record that comes out of the album. The pin background is a pink sky, soft purple skyline, green bushes, light green grass, and brown path. The pin comes on a special card that uses pictures of records in the background. The card says Vintage Vinyl at the top in neon sign type red lettering. In the lower left on one of the records it says Limited Edition. This is the first pin in the new pin of the month Lunch Time Tales Series released at Walt Disney World Resort for 2018. The front of this pin pictures what looks like the film poster for Lady and the Tramp in the shape of a lunch box with a yellow handle. You can open the lunch box to reveal a plate of spaghetti, bread sticks, a red and white checkered thermos with a grey lid, and a yellow posted note with a paw print on it with a blue and blue-grey background. ACME/HotArt- Limited Edition 300 - Lady and the Tramp Puppies Opening Gifts Jumbo (approx. 3"x 3") Collector Pin. Scamp is on the right and is tugging on a pink ribbon attached to a pink and white present. Three Cocker Spaniel puppies are on the left side of the pin smiling while watching Scamp. There are two more presents are on the pin: a large present with blue wrapping paper and white polka dots and a smaller present with brown wrapping paper, all of the the presents have pink bows. The background is green. This jumbo pin is an official Disney licensed pin made by Acme Archives. It is an approximately 3"x 3" round pin with a gold back with a gold bar pattern with 3 posts and the ACME Archives copyright stamp. Enjoy the high quality that Acme Archives Shanghai is known for in this limited edition Disney pin. This Acme Archive pin will be made for the Pinopolis Pin Game. Each pin will have a random game value etched on the back. This pin features Bolt, from the Disney "Bolt". He stands with ice cream in his bowl. Limited edition to 300. Underdog is featured with the El Capitan Theater Marquee in this Limited Edition pin. Underdog is sitting on the Marquee, wearing a red shirt with a "U" on his chest and a blue cape. The Marquee has a large, red U in the center and says Underdog in silver letters on top of the red "U". This is a 2 post pin. The first pin in Disney Movie Rewards’ Around the World Collection. This pin was exclusive to Disney Movie Rewards members and was available on September 28th, 2017 for 900 points. The pin also came with a collectors box to display the pins in the series. This pin features a Dalmatian puppy from 101 Dalmatians and proclaims “Welcome to London” over a pink and purple Tower Bridge, Thames River and green and pink trees and bushes on a white background. The puppy and sign are both pin-on-pin. This is one of the November 2015 Hong Kong exclusive release in an Artist Series set of Lithographic art print and Super Jumbo Pin taken directly from the art work. This pin shows Lady and the Tramp in a big heart, in the pin all other dogs are shown from thee movie Peg, Jock, Trusty, Boris, Toughy, Bull and Pedro. The pin is designed by Amy Mebberson. Pin is approximately 4 1/2 inches x 5 inches. Art print is 4" x 6" and comes with a certificate of authenticity. All comes in a presentation quality box.